Important notice: All miniatures supplied unpainted and may require some assembly. Confused by all the choices? May we recommend, Savior of the Universe ($100)? Relic Knights ™ Darkspace Calamity is a fast-paced strategy battle game by Soda Pop Miniatures and published by CoolMiniOrNot, for 2 or more players. Each game lasts about an hour for the Faction Starter size, and how you manage your abilities and resources (represented by the Esper Cards) will determine the fate of the universe! Kickstarter objectives - Relic Knights is the first game created by Soda Pop Miniatures, which has been outshone by its younger smash hit sibling Super Dungeon Explore! Love of over the top anime action! The Savior, Double Savior, and Gotta Catch Em All pledge levels have 2, 4 and 6 Special Edition Miniatures included free respectively. Get them now, we expect to sell these at conventions for $15 each, and probably won't make anymore when they're done! All Cosplay Special Edition characters (except Marie-Claude) represent a Darkspace alternate of their normal version. These Darkspace alternates will possess slightly different rules and in most cases are fielded by different factions. All SDE Crossover figs come with a card to use in Super Dungeon Explore! A Questing Knight for the Cerci Speed Circuit Faction. "Racers aren't the only thing that can go fast. My kicks are quicker than the blink of an eye." "No matter the mission all I need is my trusty box." "Not all who are enslaved are broken." "Whether in this universe or another I will defend you with my life!" "Their mastery of Esper is unparallelled and I crave its power"
"My motto is shoot them before they shoot you, out here it's survival of the fittest." * Savior level pledges come with your choice of 2 special edition miniatures! Or get them for $10 each with any $50 or above pledge! Candy Rush and Void Reaper each counts as 2 special edition miniature choices, or get them for $20 each with any $50 or above pledge! Miniatures of the concepts above are what you will receive in the Noh Faction Starter. Final sculpts may vary in pose and details. The stuff of nightmares, a Noh incursion appears without warning, their dark fleets using ancient technologies that predate mankind’s ascension amongst the stars. Bestial and cunning warriors all, the Noh spread terror and chaos in the name of their dark god. Whatever you do, don’t be taken alive! What you get in the Noh Empire Faction Starter! Marikan-To – Master of the Lords hunt, Marikan-to leads the Noh’s far ranging scouts. 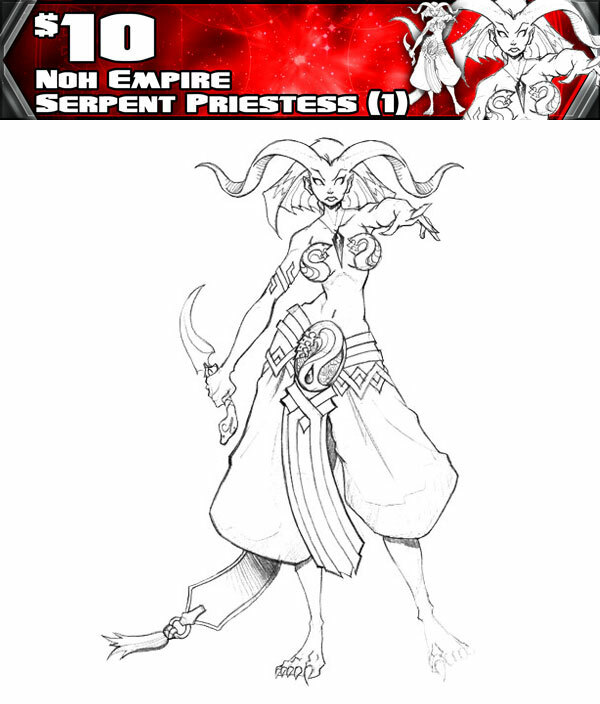 Zinenda and Spite - Traditionally priestesses of the Hydra God strive to ensure their neutrality as Nozuki’s voice and serve as arbitrators between the eight Noh Dragon Fleets. Miniatures of the concepts above are what you will receive in the Black Diamond Faction Starter. Final sculpts may vary in pose and details. The Black Diamond will do business with just about any customer for a price, and with the growing unrest around the Darkspace Calamity, business has been good. Black Diamond wields incredible military power and its agents, incredible political influence. Suspect 7 - The Black Diamond can afford the best corporate assassins from around the Galaxy. It is said she can be anywhere for any target, it just gets strange when she is on both sides of the galaxy at the same time on different contracts. Leopold Magnus & Static - Leopold is determined to unravel the mysteries of the Relics and will literally stop at nothing to achieve his ends. His cypher, Static, eagerly aids him in his pursuit, especially when it involves tearing apart enemy relics and severing other cypher’s connections to Esper. 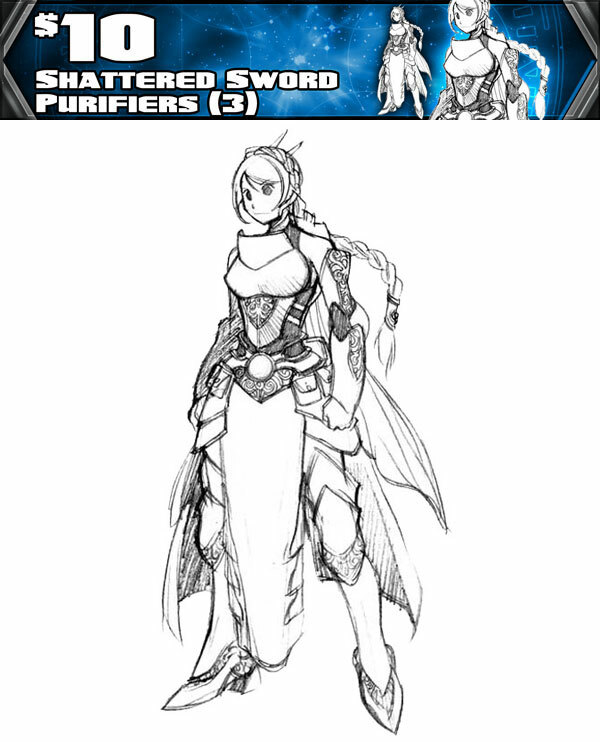 Miniatures of the concepts above are what you will receive in the Shattered Sword Paladins Faction Starter. Final sculpts may vary in pose and details. Though few in number, the might of the Paladin orders has kept the peace and fought for civilization since their founding. When assailed by the worst horrors and evil the universe can muster, there is not a creature that does not look skyward in hopes of seeing the falling stars of the Paladins’ meteoric strike. Their armor gleaming white, their swords and lances tipped at the throats of evil, who could possible stand before them? Isabeau Durand - After joining the ranks of the Paladin Order, Isabeau nurtured her skills as a warrior as well as the healing arts. Supporting her brother and sister paladins on the field of battle, and hoping to one day find the band of Noh slavers that took her family. Francis Mallory & Quill - Francis is the oldest surviving Paladin of the Shattered Sword. Now unburdened by the role of leadership he is given to taking up obscure quests and battles that normally the order could not spare resources for. Miniatures of the concepts above are what you will receive in the Doctrine Faction Starter. Final sculpts may vary in pose and details. While it is true that Codifiers gain their mastery of Esper through careful study and implementation of the arcane writings of the Doctrines, it is a mistake to think they are frail sages who crumble in battle. To truly master the Doctrines requires not only strength of mind but also of body; a codifier is just as likely to follow up a fiery blast of Esper with a skull cracking swing of her stave. Togan and Cecelia - Old man Togan holds his office together with the veracity of the thinning straps on his university robes. It's good he has the indefatigable Ceclia to clean up after his messes. Delphyne & Ekhis - Given the natural tendency for those with cyphers to be drawn into combat one may consider it cruel that Delphyne, a girl of barely eight cycles, would be burdened with such a "gift". Ekhis, her cypher, has taken her safety into account with his physical manifestation and proven himself more than capable of acting as Delphyne's protector. 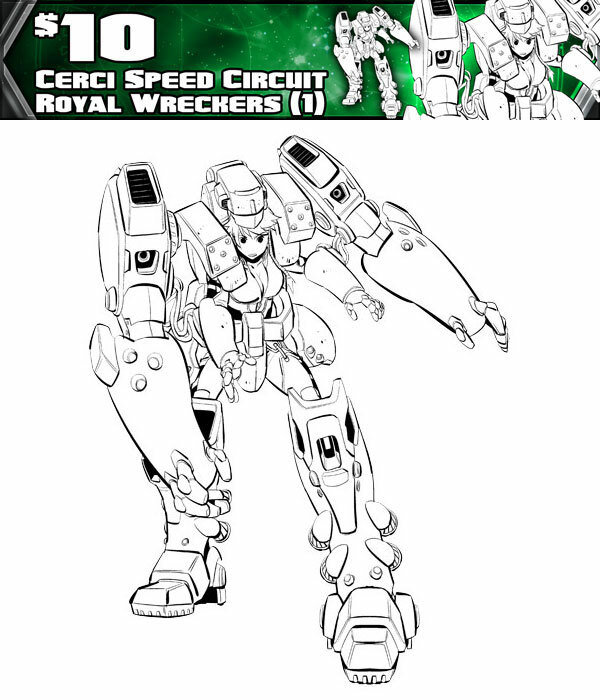 Miniatures of the concepts above are what you will receive in the Cerci Speed Circuit Faction Starter. Final sculpts may vary in pose and details. A world built for pleasure can house a world of dangers. The fast lifestyle of its racers, gamblers, and gangsters are famous the galaxy over. Resourceful, and tingling with the need for speed and excitement, the young and brash racers of the Cerci Speed Circuit will learn soon enough what fate has in store for them! Rin Farrah - The Cerci Speed Circuit is no mere raceway. It is an entire planet given wholly to the adrenaline rush of speed. High stakes require strict measures to control "audience participation". Suicide Queen & Rollo - For Suicide Queen, life was easier before her cypher, Rollo appeared. 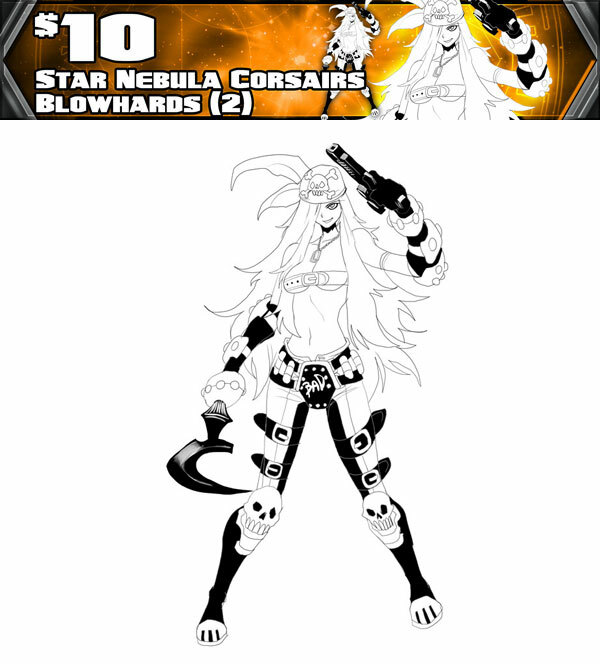 Miniatures of the concepts above are what you will receive in the Star Nebula Corsairs Faction Starter. Final sculpts may vary in pose and details. Striking without warning, these space born privateers are matchless in their cunning and lust for riches. Led by the indomitable Calico Kate, the fleets of the Star Nebula are a terror to the UPA’s shipping lanes. But the coming Darkspace will force every living soul to make a powerful choice, continue to hurtle into the abyss, or gather courage to fight back against its relentless advance. Iron Chef - Calico Kate has very particular tastes, and her eight foot tall four armed galley cook, simply called "Iron Chef" is sure to be wherever she is. Fiercely loyal, and the freshest ingredients, whatever you do, don't end up on the menu! Harker has plundered and pillaged across space with such success that he could buy a planet and retire in opulent splendor. Doing my Part! - Lithograph Signed by the Relic Knights Team! Champion of Justice! - Special Edition Candy and Cola (see below) and a signed lithograph! Esper Font - Hardback Rulebook, Special Edition Candy and Cola (see below) and a signed lithograph! Mercenary Charter - 1 Faction Starter of your choice and a signed lithograph! Pick your Factions after the Kickstarter ends from any of the unlocked Factions! Ships free in the USA. Everywhere else please add $15 to your pledge. Savior of the Universe! - TWO Faction Starters of your choice, Hardback Rulebook, and TWO Special Edition miniatures! Pick your Factions after the Kickstarter ends from any of the unlocked Factions (even duplicates)! Ships free in the USA. Everywhere else please add $25. Swap out the Hardback Rulebook for a $35 value for more optional stuff. Double Savior! - 2 x Savior of the Universe! Two of everything from Savior (i.e. you get 4 Starter Factions). Pick your Factions after the Kickstarter ends from any of the unlocked Factions (even duplicates)! Swap out the Hardback Rulebooks for a $35 value each for more optional stuff. Gotta Catch Em All - 3 x Savior of the Universe! Three of everything from Savior (i.e. you get 6 Starter Factions!). Pick your Factions after the Kickstarter ends from any of the unlocked Factions! All Dolled Up - 1 x Savior of the Universe fully painted by Worthy Painting, the official studio of Soda Pop Miniatures! Pick your Factions after the Kickstarter ends from any of the unlocked Factions (even duplicates)! Everyone loves options! Just add the appropriate amount to your Mercenary Charter or above level pledge and we'll confirm all the details with you after the Kickstarter ends! A rampaging engine of destruction in its own right, the Diamondback Assault Armor is a sight to be feared as it pummels its way through foes! Also includes bonus Breaker Team! Boasting razor sharp teeth and a fiendish intelligence, these are not normal dogs! Alone, the Beastmaster is already extremely dangerous, but together with Agha and his trusty beasts he is truly a force to be reckoned with! The heart of this Thundarian warrior is brave and stalwart in the face of his foes. As many of his enemies know the oblivion brought by his mighty hammer, so to are his brothers witness to his mighty compassion for the lives he has saved. Fiametta and Hasami. Whether pitching whole wings of their mystical university into ashen ruin, or hurling a storm of metal shards from the shadows, these two powerful mages are eager to uncover the mystery of the Darkspace. Every successful racer in the circuit can rely on a great pit boss to manage all the fixin’ that need be done. Betty and her companion Lug are just such a pair. Also includes: 2x Pit Crew! Kenobo, wanders the galaxy as a sell sword with his remarkable skills, forever haunted by the fate of his people. Kate’s hired hands also extend into practitioners of the Doctrine. Squall is just such a rogue, plying her mage’s trade for the highest bidder. Tapping into that raging beast, Wildspace has made a name for himself among the spacelanes, pillaging to add to his own horde, and facing the oblivion of the darkspace on his own terms. With Wildspace goes his cypher, The Merch. His shipmates often wonder who works for who. A prefect of unimaginable skill, and a warriors grip of the doctrine's codex, Tycho Brahe, a fully fledged codifier, has set out save the universe by discovering the "omega code". As the universe seems to favor personalities of such magnitude and import, Tycho's cypher was revealed to him in the form of a favorite breakfast making accessory. 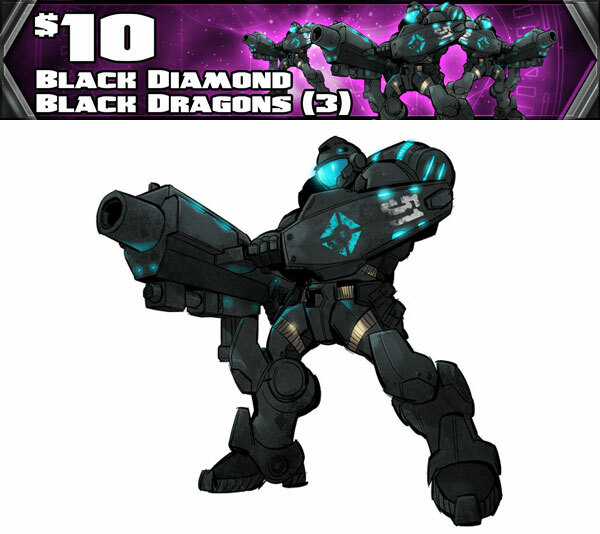 •	The Black Dragons are the elite of Black Diamond’s mercenary forces. Equipped with the heaviest tactical powered armor available they excel at both defending their convoys and black ops offensives. •	The Hydra God, Nozuki, demands strict and unceasing devotion as well as a constant stream of souls to sate his eternal hunger. It is the Serpent Priestesses who ensure his will is done. •	With calamity on the rise it grows increasingly difficult for the paladin orders to maintain the peace. It is the Purifiers task to secure safe havens, scouring them of any corrupting influences, and then tend to those in need. •	When your racer gets slagged you need to be able to recover the wreckage quickly so your pit crew can get immediately to work. The Royal Wreckers excel at raceway recovery and should the occasion call for it, performing a little wrecking of their own. •	The young minds of The Doctrine’s Erudite Prefectorium for Scholarly Excellence are its most valuable resource. In this time where Esper itself is torn asunder the Doctrine will need every practitioner it can call upon. It is these grim, construct, guardian’s duty to to ensure their safety. •	Sometimes what you need to get in is an explosion. Sometimes what you need to get away is … an explosion. Blowhards take to the sappers art with relish: breaching hulls, exploding safes, and booby trapping escape routes to ensure none can follow. 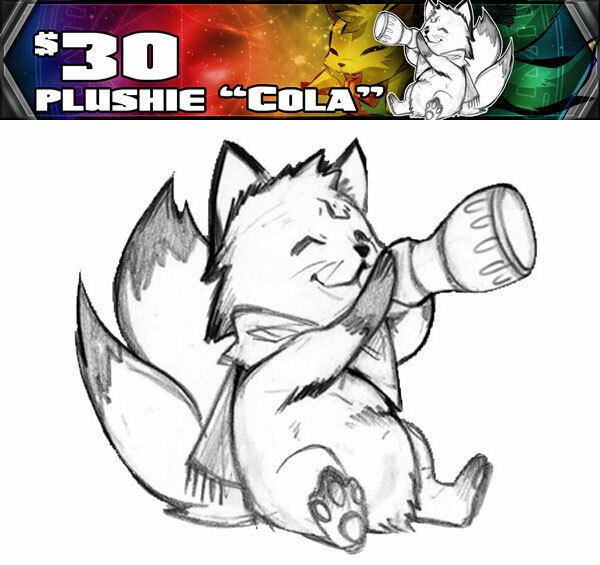 Well.... this is just a cute 8" plushie of Cola, the awesome Soda Pop mascot! Available only here or at conventions! Get a hardcopy of our 24 page origins story manga! (Will be available as a free PDF too). Boosts are little 1 or 2 point items that you can use to increase the performance of your cadre by augmenting individual models! 1 set included free per Savior set. A huge 3' x 3' rubberized mat with great little terrain details on it! Play Relic Knights in style!